I tremendously respect and admire playwrights who bring an immediacy of personal reactions to their stories of racial conflict and tension within the theatre. The Stratford Festival’s recent production of “To Kill a Mockingbird” is only one example that comes to my mind. I had read in earlier press releases that Marco Ramirez’s “The Royale” deals with racial tensions in the Jim Crow era. As I sat quietly waiting for the play to begin, I wondered if audiences are becoming saturated to the point where we feel nothing about this theme? I was neither a fan of boxing nor did I consider it to be a sport, so I had no idea what I was about to see theatrically. I couldn’t wrap my brain around the idea of how two trained athletes who try to bash each other in the head can be considered a sport where one emerges victorious. The Program Notes did offer some important historical background to understand the play. Jay Jackson (Dion Johnstone) is loosely based on a real fighter named Jack Johnson who, in 1910, defeated Jim Jeffries to become the first African-American Heavyweight Champion. White America was incensed over this and a search began for ‘the great white hope’ who could beat Johnson. Ken MacKenzie’s set design reinforced the immediacy of the suggestion of a boxing ring. There were ring side seats for audience members on both sides. There were the ropes to cordon off part of the ring and behind the ropes was a bench for actors to sit. A door was found upstage right. At one point, a punching bag is lowered. Back to the Program Notes again which called boxing ‘the sweet science’ for the fact that the sport is primal theatre. Ok, this connotation hooked my attention. When I read further, I also discovered that Ramirez was fascinated by hip hop. I’m not a fan of hip-hop music and again thought this might not turn out to my liking. Was I sadly mistaken when these ninety minutes flew by. The influence of the sound of hip hop in this production boldly underscores and heightens the thick, dramatic tension in this taut script. Told in six rounds, “The Royale” deals with the story of Jay trying to achieve his dream in boxing. Director Guilllermo Verdecchia has cast five dynamite actors who tell this story with humour, compassion, spirit and hope. Dion Johnstone excels as a physically fit, terrific Jay whose struggle to succeed at the sport is often hindered by his skin colour. Alexander Thomas as Jay’s curmudgeonly trainer, Wynton, realistically reveals the tough endurance required for the sport. As his white, quick thinking promoter Max, Diego Matamoros was fascinating to watch in his moments with Johnstone and especially in the press conference scenes. Christef Desir offers a dynamic contrast as Fish, a youthful competition for Jackson who might be considered an ally. Where the play was the strongest for me was in the intense and emotionally charged scene between Jay and his sister, Nina (Sabryn Rock). Ms. Rock delivered a bravura performance as she tugs at Jay’s heart (as well as mine) about whether it was best to continue in his quest as a boxer. Even in her quiet moments of despair and those heightened moments of frustration nearly bordering on tears, I could hear Ms. Rock’s dialogue clearly and was on her every word. Breathtaking for me. 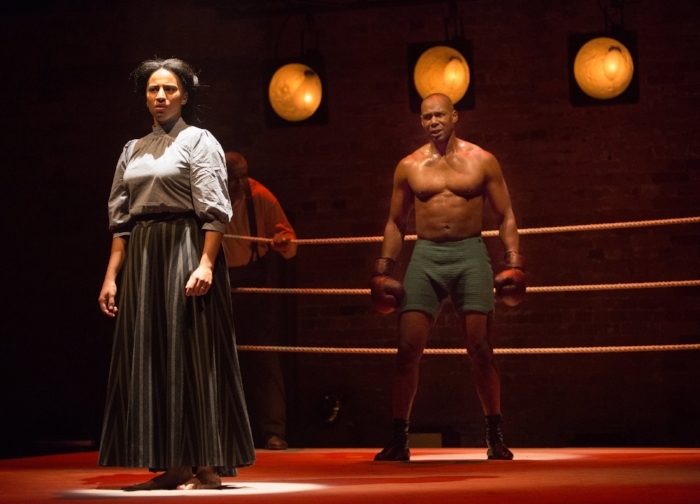 Final Comments: I knew boxing could pack a hefty gut punch, but I never thought it could pack a wallop to the heart as it does in the Canadian premiere of Marco Ramirez’s play. I’ve never seen the HBO series for which Mr. Ramirez writes: Orange is the New Black and Sons of Anarchy. I believe I will have to have a gander at them. “The Royale” continues to November 11, 2018 at The Young Centre for the Performing Arts, 50 Tank House Lane, Toronto’s Historic Distillery District. For tickets call (416) 866-8666 or visit www.soulpepper.ca. The performance runs 90 minutes with no intermission. Photo of Sabryn Rock, Alexander Thomas and Dion Johnstone by Cylla von Tiedemann.